As a clinician are you following best-evidence guidelines for managing your patients with low back pain? As a patient, how is you doctor managing your low back pain? 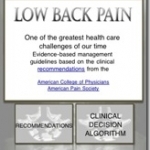 We review Low Back Pain Clinical Management Guidelines app from Clinically Relevant Technologies.